OK condition -- used in the Balinese Room, Texas -- see Box100b, below. ... ... ....Note: Box 100a and Box100b are the same chip as far as the color of the inlay and clay go -- just different scans account for the differences you see on this page. Here is the elusive $100 purple (not the more common red one) Balinese Room, Galveston, Texas, crest and seal poker chip. (Another difference is that the red one has black print in the inlay; the purple one has green print.) A check of the latest edition of Ed Hertel's "Illegal Chip Price Guide" will verify that this chip is from the Balinese Room. It is also identified in Frank Chalfant's "Galveston Island of Chance," and in other works. There is an added plus to the chip! You'll note that it has a small shamrock discretely branded into the rim of the chip, probably for security purposes. 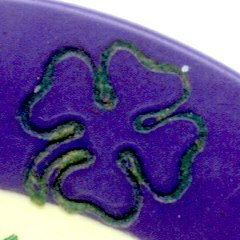 Click here for a closer view of that shamrock.